And it was Maranello’s motor department’s work that seemed to be catching Mercedes’ attention. The Brixworth power unit group had delivered a very significant upgrade for Spa – but Ferrari’s seemed even better. A downbeat Hamilton afterwards referred to Ferrari’s “tricks with their engine”, which he later clarified as “Just a word for something special,” but it carried the tone of competitive paranoia. “They have a power advantage,” said Toto Wolff. “We saw that yesterday in qualifying; it is at various parts of the straight and even if the exits are worse than ours, they keep pulling. But having said that, it is nothing that could be a trick; it might also be relate to how you run and calibrate your engine. 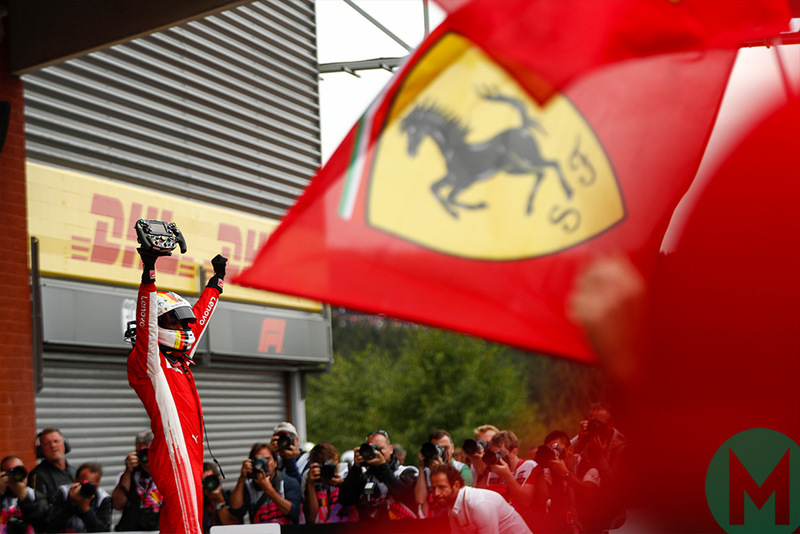 The way that Vettel was able to surge past Hamilton up the Kemmel straight on the opening lap – and how Hamilton wasn’t able to return the favour upon the restart was certainly consistent with a Ferrari power advantage. But it was also consistent with a significantly smaller rear wing on the Ferrari – and with the Merc’s inferior traction out of La Source. Despite the bigger wing, the W09’s traction was worse – and it was eating through its left-rear tyre quicker. The Ferrari was just all-round better at Spa. 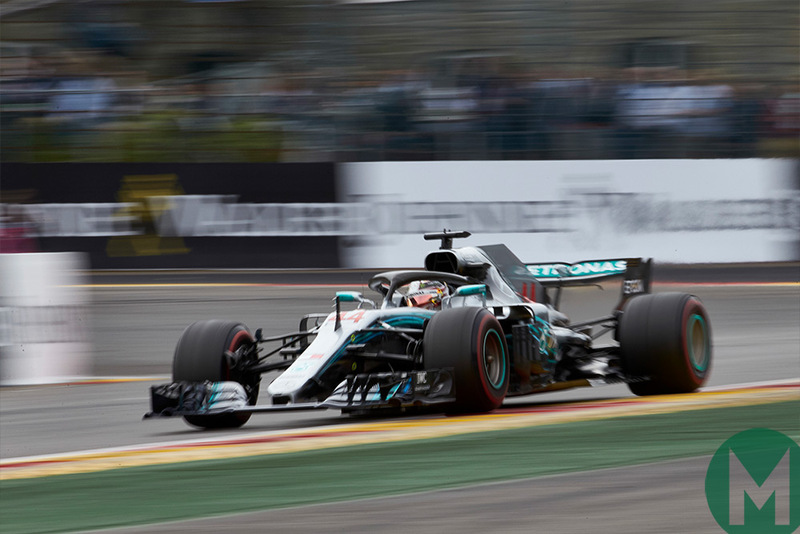 A topsy-turvy wet Q3, together with Valtteri Bottas’ engine penalty, left the other four fast cars sidelined out of position. That gave Vettel and Hamilton a nice Force India buffer between them and the rest for much of the race. 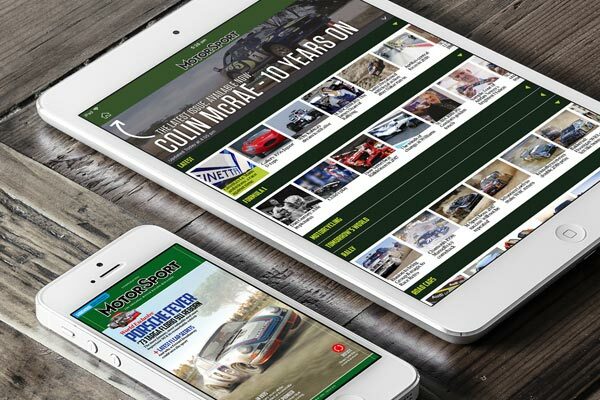 They therefore were able to run their races without interference or undercut pressure from the ‘other halves’ and what we saw was therefore a pure representation of their performance. Vettel and Ferrari won it hands down. Max Verstappen, running surely the skinniest rear wing seen around Spa since the device made its F1 debut here in 1968, eventually pierced the defences of Force India to complete the podium. The respective fourth and fifth places of Sergio Pérez and Esteban Ocon got the ‘new’ Racing Point Force India team’s first points, to leapfrog straight past Williams in the cash-paying constructors championship. "It’s terrifying though because it can all go wrong"
The rain intervened again to rescue Hamilton’s day. 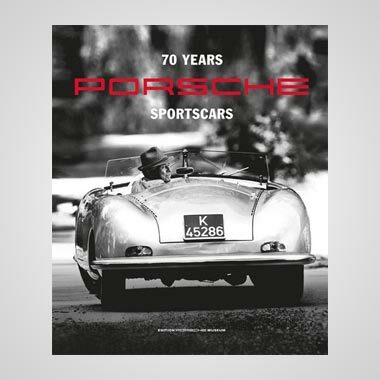 In the dry, the Ferrari looked to have a small but consistent edge, prodigiously accelerative everywhere and, with their smaller rear wings, faster than the Mercedes down the straights of sectors one and three but still very compliant and driveable through the twists of sector two. Both were fitted with newly upgraded engine specs, the Merc now trailing a haze of smoke just like Ferraris. Just like on race day in Germany and qualifying in Hungary, the wet track neutralised the Ferrari’s small advantage. 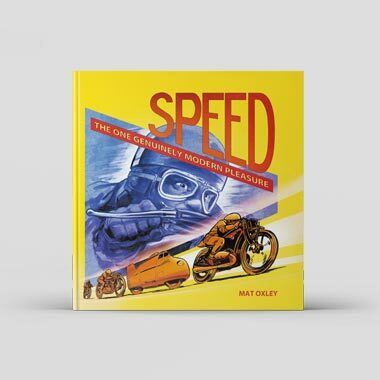 But it fell in a way that was impossible to anticipate and with such a long lap it caught more than a few people out – and opened up a window of opportunity for others. The expectation as the cars queued up at the end of the pitlane for Q3 was that there’d be time to do a single slick-tyred lap, two at a push. Some, Räikkönen’s Ferrari and the two Red Bulls, were fuelled accordingly. Ferrari split its strategy, putting Vettel on a multiple lap (ie rain) fuel load. But the black cloud broke even before the green light went on, dropping much of its load in the valley comprising sector two and its fast downhill bends. Everyone, apart from the two Force Indias, was straight back in for inters. The rain stayed constant for a couple of laps, at which point Vettel was fastest from Räikkönen, Verstappen and Hamilton, the latter having been off the road at turn 12. 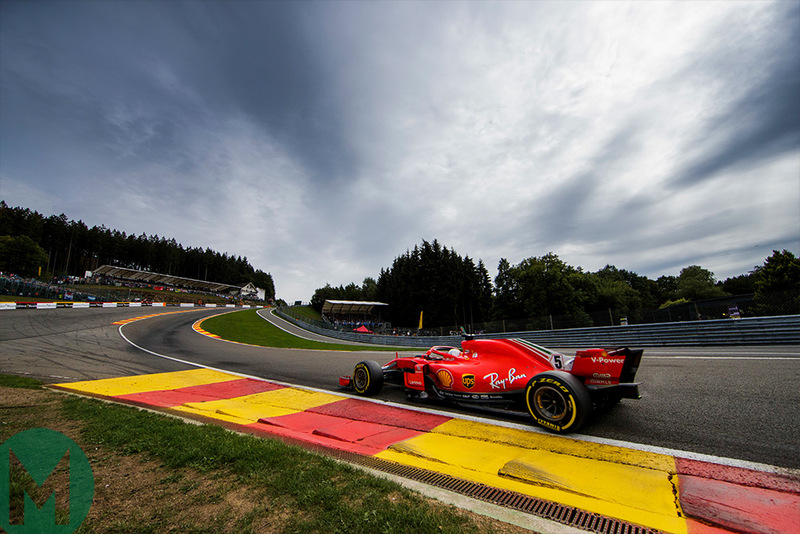 But thereafter the rain eased, the track became quicker and Räikkönen and the Red Bulls had to pit to prevent running dry on track – but with not enough time to refuel and get back out to the start/finish line before the flag. So those fuelled a little longer were the ones able to take advantage of the drier track. For Vettel it was all a little fraught. He’d been frustrated over indecision in the Ferrari pits as he and Räikkönen had returned to be rid of their slicks. Then he’d caught traffic at an awkward place as he tried to put a lap together and in between all that and trying to second-guess if the rain was going to get heavier or ease off – and therefore not knowing which lap the track was going to be at its quickest – he found he’d not fully recharged his battery on the penultimate lap and so would be without all of its extra 160bhp for much of the crucial lap. The difference between Vettel’s power shortfall and Hamilton’s perfect last-gasp lap was measured as 0.7sec. Because Bottas was starting from the back of the grid for an engine change, he didn’t do a serious Q3 run and only left the pits in order to try to give Hamilton a tow (something that was rendered null anyhow as he spun out of position on his slicks as the rain fell). This and the enforced early surrender from the session of Räikkönen and the Red Bulls opened up a second opportunity for someone, and remarkably it was filled by the reborn Force India team, now going under the name of Racing Point Force India. Its cars always go well here (recall Fisichella’s pole in 2009), but this remained a great achievement for a team fresh out of administration and which is now having to start from scratch in the constructors championship. “Whatever the car is supposed to be called it’s not supposed to be third on the grid,” said an admiring Vettel of Esteban Ocon’s performance, the Frenchman mere hundredths faster than team-mate Sergio Pérez. With his future undecided it was a timely reminder of Ocon’s ability. “If you do a strong job the teams cannot ignore you, they need to have you. So that’s what I’m trying to do.” Pérez got time for only one inters-shod lap after damaging his front wing over the Bus Stop chicane and having to pit for a replacement. “Another lap and maybe we could’ve fought for pole,” he beamed. Both had tried for a slick-shod lap as everyone else had pitted for inters, but the rain only intensified at that point and Pérez came oh-so-close to a monumental accident at Raidillon. On such fine margins were destinies decided. Also slotting into the gap of opportunity provided by the compromised Bottas, Räikkönen and the Red Bulls was Romain Grosjean, who in the most difficult of circumstances was sure-footed, error-free and fast, slotting the Haas into fifth place, 2.8sec faster than ninth-fastest team-mate Kevin Magnussen. The cars weren’t their usual speedy selves in the dry and it took some massaging of downforce levels between sessions to unlock their potential. Räikkönen, Verstappen and Ricciardo were deeply frustrated in sixth, seventh and eighth respectively, the Red Bulls with their tiny rear wings struggling in the wet conditions even before they ran out of fuel. 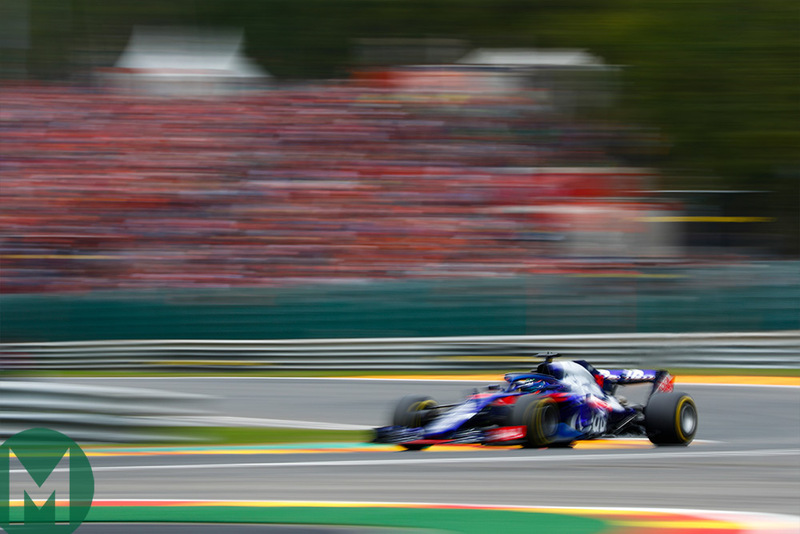 The fast flows and long straights of Spa are not ideal Toro Rosso-Honda territory but Pierre Gasly and Brendon Hartley were best of those not making it into Q3, at around 0.5sec off Magnussen. They each lost their second Q2 runs as a result of Hartley’s car suddenly locking its rears and spinning into turn one – when Gasly was right behind him, planning to use his team-mate’s tow. For much of the weekend and into Q1 the Saubers looked likely Q3 contenders. 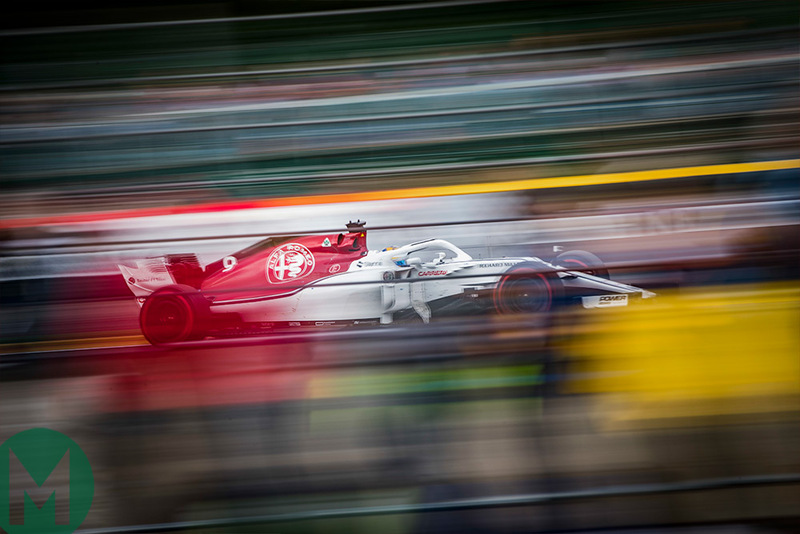 But ultimately, niggling technical and operational issues in Q2 prevented either Charles Leclerc or Marcus Ericsson from delivering on their potential and they lined up only 13th and 14th respectively. Nico Hülkenberg was taking a gearbox penalty in the Renault and, with a delicate engine that needs to complete a lot of miles in the remaining races, his car stayed in the garage after Q1. Team-mate Carlos Sainz suddenly found gripless oversteer in Q1 on both sets of tyres, leaving him a mystified 16th, unable to graduate to the next session. The Renaults later took fresh engines and so started from the back. Spa is configured to heavily punish an aero-inefficient car, especially one with a power shortfall. 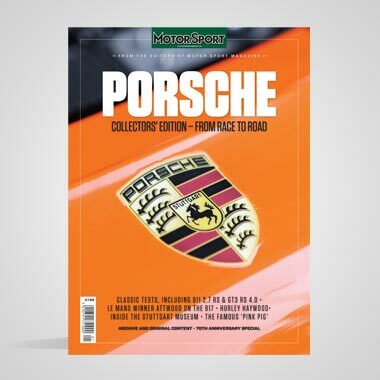 Hence McLaren had a terrible time, and even a perfectly executed mutual towing exercise from Fernando Alonso and Stoffel Vandoorne put them no better than 17th and a solid last respectively. They sandwiched the Williams duo, with Sergey Sirotkin a couple of tenths quicker than Lance Stroll. A bright breezy day in August as the cars made their way around the parade lap of the majestic circuit, orange smoke bomb plumes among the burger fumes. Hamilton, from the inside line pole had given him, was able to fend off the faster-accelerating Ferrari of Vettel, squeezing him tight left before turning in. 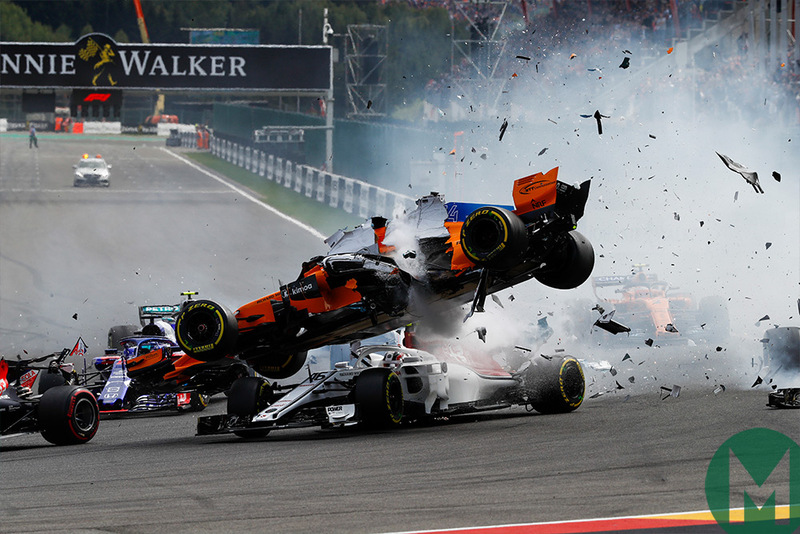 The Force Indias and Verstappen followed through just as a violent three-car crash unfolded, triggered by Hülkenberg getting his braking all wrong, hitting the back of Alonso hard, sending the McLaren spiralling over the top of Leclerc’s Sauber. The heavy tyre marks upon Leclerc’s halo suggested it had done its job – and no one was harmed. 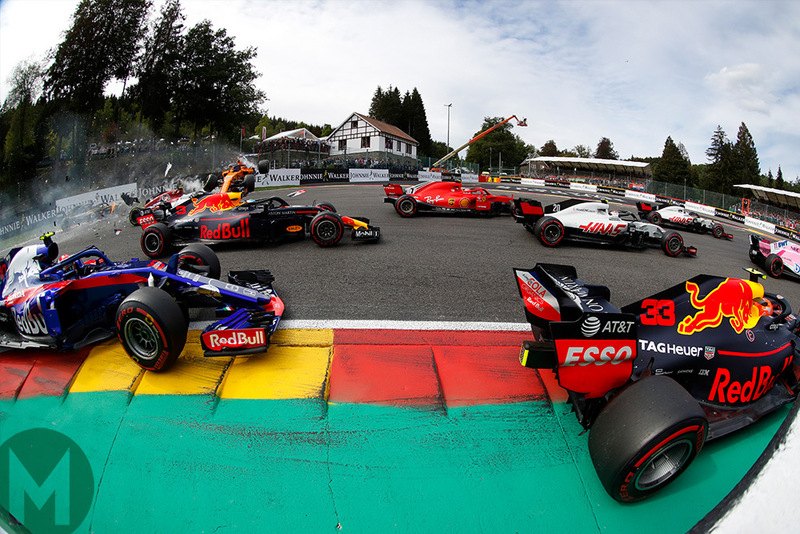 Ricciardo’s rear wing took some collateral damage, then as he rounded La Source he found himself pincered between Gasly to his inside and Räikkönen to his left. The Red Bull was briefly airborne even as the other accident was still playing out and its front wing endplate punctured Räikkönen’s right-rear tyre. 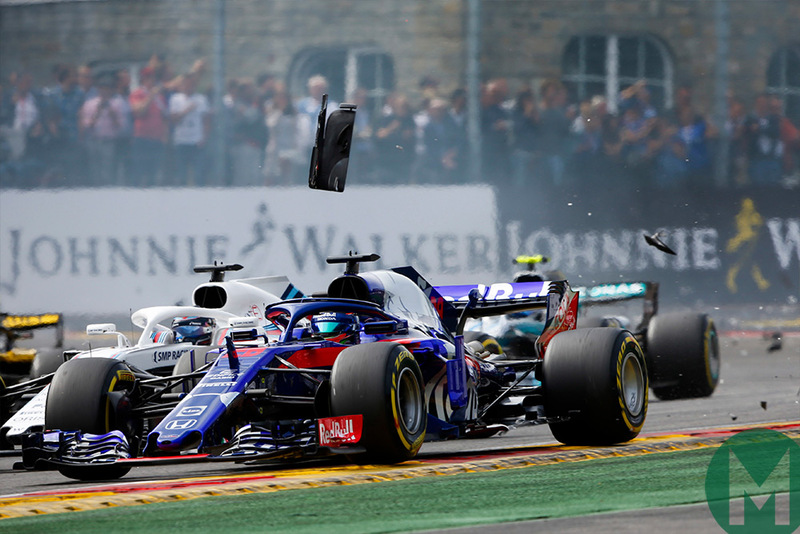 Bottas was another too hot into the turn, though with less dramatic consequences – he hit the back of Sirotkin and damaged only his own front wing. 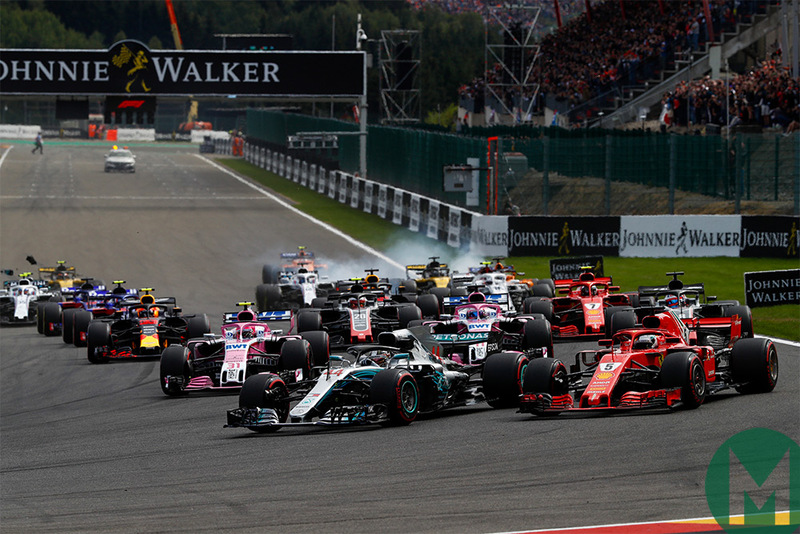 Hamilton led them all down the hill with Vettel, Ocon and Pérez tight in his 200mph wake as they crested the rise of Raidillon, blasting towards the distant to Les Combes. With a strong headwind, the slipstream effect was powerful and Vettel nipped out of the Merc’s slipstream to take the lead as they approached the braking zone – with Ocon getting a run on them both and looking down Vettel’s inside. He seemed to back out of it, perhaps sensing the career stakes and how this wasn’t his battle. As he tucked in behind Vettel and Hamilton, Pérez was able to go around his outside to claim third. Only then was the race put under the safety car to clear the turn one debris. At which point Vettel was cursing. He’d done the difficult part of slipstreaming past Hamilton and had been ready to unleash the Ferrari’s pace. But now he was in the vulnerable position Hamilton had been, punching the hole in the air that his pursuer could take advantage of when they were all let loose again. Räikkönen and Ricciardo stopped for repairs at the end of the lap, Bottas did the same for a new front wing a lap later, using the safety car period not to lose touch with the pack. Kimi would stop for good before too much longer, the floor of the Ferrari too badly damaged. Replacing Ricciardo’s rear wing put him a of lap down and he too was eventually retired to save engine mileage. Hamilton wanted to get ahead before Les Combes, to have a better chance of making it stick. 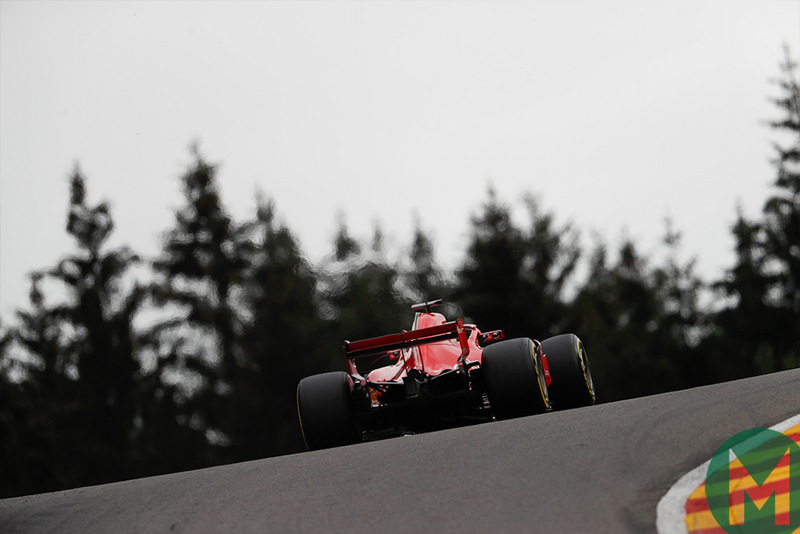 But his little feint down the inside of the chicane had lost him some ground as Vettel was in full attack mode, getting a beautiful and crucial exit from La Source. Hamilton’s exit just wasn’t as good – and wouldn’t be all race. The Ferrari was already 0.9sec ahead by the exit of the corner. The Mercedes did not have the traction of the Ferrari despite its bigger rear wing – and that precluded the possibility of getting close enough to slipstream Vettel. He was now in comfortably familiar territory, making an early run for it and breaking the DRS gap. 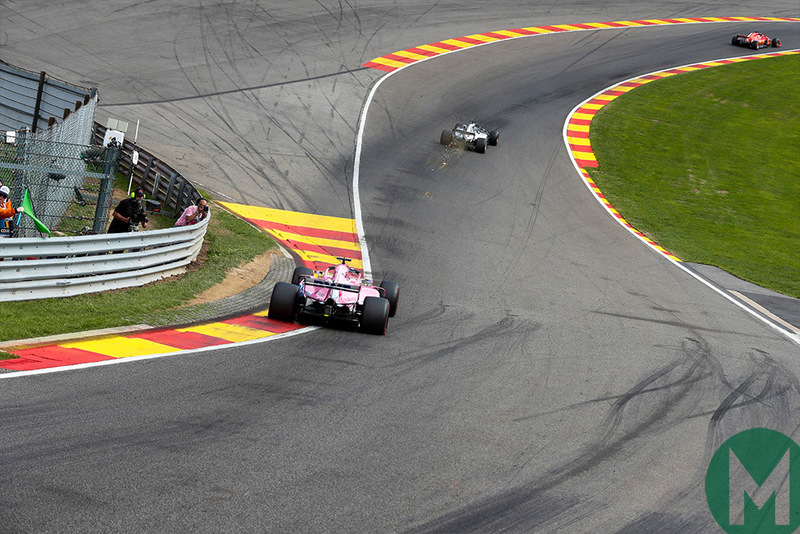 The two leaders put plenty of distance upon the Force Indias, with Verstappen able to get by Ocon and Pérez on consecutive laps, with DRS up to Les Combes. By the time he arrived in third place he was already 8sec off the lead and generally lapping around 0.5sec slower, once Vettel had stabilised the gap over Hamilton at 3.5-4sec. Grosjean was having a lonely but faultless race in sixth, no threat to the Force Indias but always out of reach of team-mate Magnussen. The Dane headed a train comprising Gasly and Ericsson that was able to steadily ease away from the Williams pair Sirotkin and Stroll, chased by Sainz, Hartley having been delayed in the Ricciardo/Räikkönen/Gasly melee and being passed on all sides as he’d lost momentum. 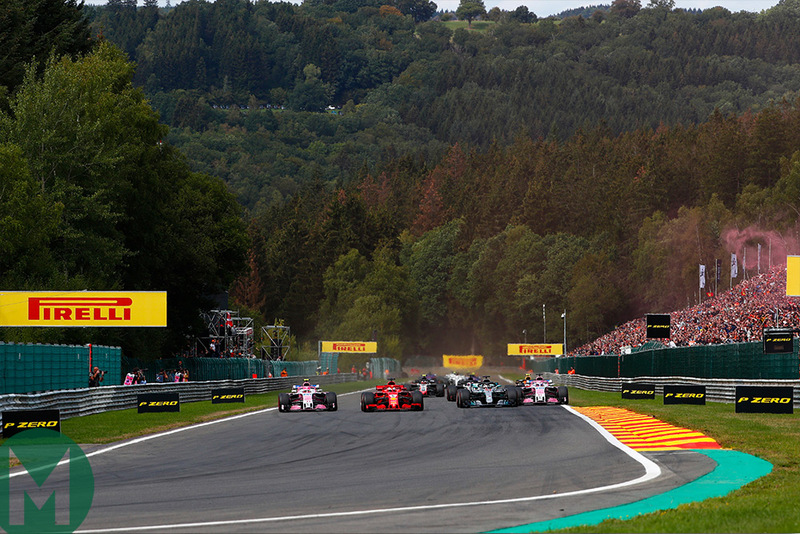 Predictably, Bottas was quickly on the move from his last place at the restart – picking off Vandoorne, Hartley (around the outside of Eau Rouge! ), Sainz, Stroll and Sirotkin in quick succession. Like most of those outside the top 10, he’d started on the soft rather than supersoft, but its greater range didn’t really have a profound effect on mixing anything up. The super ended up being much more durable than on Friday, allowing everyone access to a comfortable one-stop strategy regardless of starting tyre. Bottas had taken the opportunity of switching to the super as his wing was changed. Hamilton was 3.9sec down on Vettel by the 14th lap – and with the pitstop window opening he tried to close it down, setting the race’s fastest lap to date next time around, and a yet-faster one after that. But not only did Vettel up his pace in response, the strain upon Hamilton’s left-rear super-soft began to tell and soon there was a line of blisters around its circumference. The Ferrari’s rears weren’t yet blistered but Vettel was beginning to suffer a loss of rear grip too. Verstappen was by now more than 16sec adrift of the lead, but his times through the fast sweeps of sector two despite that tiny rear wing were very impressive. And the Red Bull was keeping its rear tyres alive longer than either the Mercedes or Ferrari. Not enough to threaten their position, but enough to run a longer stint. With Vettel beginning to open the gap over Hamilton back out as the Merc’s blistered left-rear began to surrender, Lewis was brought in at the end of the 21st lap and fitted with a set of softs. It was a distant undercut attempt, but worth a try, as there was nothing else on offer. Urged to push and pit, Vettel’s in-lap was 0.6sec faster than Hamilton’s had been. The Ferrari stop was a slick 2.2sec and Vettel exited still comfortably in front. Hamilton had exited just behind the yet-to-stop Verstappen, which on his out-lap had helped tow him to in the first part of the lap but delayed him later. By the time he DRS’d his way past the Red Bull, he was 1.9sec behind Vettel. The undercut had reduced his deficit but Vettel comfortably had the pace to extend that gap all over again. 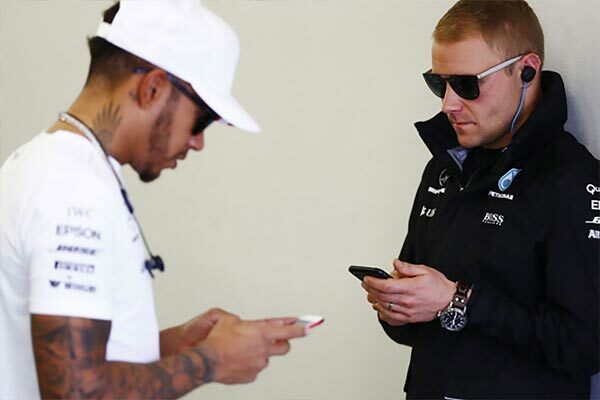 It was now clear that Hamilton and Mercedes had no answer. This was Vettel’s day. Bottas ran until the 29th lap on his supers and exited in sixth place, having used his car’s much greater pace to over-cut his way past Grosjean. He now set to chasing down the Force Indias. DRS-ing Ocon on the 32nd lap (setting the race’s fastest lap in the process) and Pérez on the 40th, just four from the end. He was half-a-minute behind the lonely Verstappen so fourth was as good as it was going to get, decent damage limitation from his 17th place start. Grosjean and Magnussen were a solid seventh and eighth for Haas. They just didn’t have the pace of the Force Indias but were able to fend off Gasly and Ericsson to the end. Sainz never did find out why his Renault had switched from a nicely balanced machine on Friday to a gripless oversteering beast for the rest of the weekend and he was out of the points, ahead only of Sirotkin, Stroll, Hartley and Vandoorne. 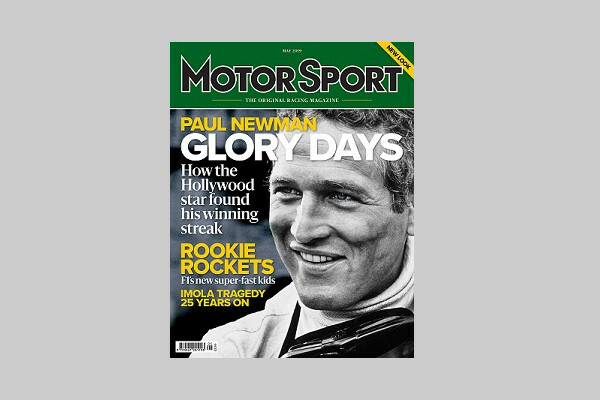 Mercedes haven’t cracked Ferrari’s code over the summer – and so we have a championship run-in with the behind-on-points driver in the faster on-form car. Hamilton can’t rely on the rain indefinitely.